Home > Backlinking > If you are not using social media in your SEO strategy read this now! The factors that Google considers for ranking websites are constantly changing. So SEO professionals are mostly on their toes, keeping track of the best signals to incorporate into the SEO strategy. While classic SEO signals like keyword optimization and link building remain important, Google Penguin and Panda updates have caused a radical change in their implementation. Additionally, newer signals like social media signals are also emerging as significant ones for search rankings. In December 2010, for the first time, Matt Cutts of Google confirmed that Google and Bing are using social signals as a ranking factor in search queries. And during the current SES Conference San Francisco, where Matt Cutts was the keynote speaker on Day 2, he confirmed that in the long term, Google will move more towards social signals, though it may currently not be that important. There is no clarity on exactly how social media affects search ranking. But the correlation definitely exists as is confirmed by this study. Searchmetrics conducted a study that covered 300,000 websites with millions of links, shares and tweets and 10,000 top selected keywords, to identify the factors that were common in the most highly ranked websites. The study confirmed that social signals from Facebook, Twitter and Google+ show an extremely high correlation with high Google rankings. See the graph below. The Y axis represents the ranking factors, while the x axis represents the Spearman correlation coefficient. Longer the bar, greater is the degree of correlation. Thus it appears that Facebook shares carry slightly more weight than number of backlinks for a website to rank high. However, it is necessary to note that this study talks of a correlation between these factors and a high search ranking and does not indicate a causal relationship. That is, it does not say conclusively that more Facebook shares and retweets will cause your website to be ranked high. So the grey area as to the extent of impact of social signals on search remains. However, that does not matter because we now know that optimizing the site for social media can influence search engine rankings. Brad Shorr introduces the concept of ‘Display Visibility’ here, which he says, is making your content more visible by enabling it to be displayed on other aspects of Google SERP such as ‘personalized search’, ‘Blogs’, ‘Discussions’, ‘News’ etc, apart from the traditional web search results. 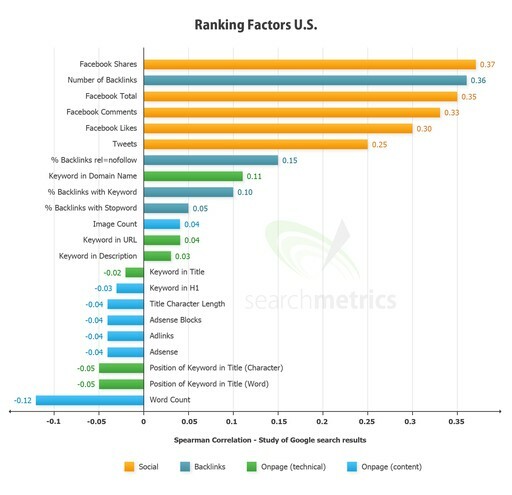 Chances of social media content making its way to the top of the SERP in these specific result areas is high. More so if the searcher has logged into his personal account for search. Content liked/retweeted or +1ed by his social contacts will receive high ranking. Without a social media presence, you can miss out on business from this avenue. Link building remains an important factor for ranking websites. Matt Cutts recently confirmed that links are still more powerful than social signals for search rankings. Social media enables you to connect easily with industry leaders in your niche and develop a relationship with them that you can leverage for acquiring authority backlinks. Social media offers a great opportunity to engage with your target audience and earn their goodwill, which can translate into more visitors to your site and thus greater rankings. This is an interesting post on how to use social media to enhance link building and thus search rankings. Particularly post the Penguin and Panda updates, Google has become very particular about the quality of website content. And one of the core criteria that Google uses to determine the content quality is the number of times people have viewed it (visited your site) or shared it (via Facebook shares/reteweets/+1s). Social media offers you a platform to tell your followers about new content you have posted and ask them to share it. And if your content is really outstanding or touches people uniquely, it may go viral. The power of viral content is huge. It is like thousands of ‘recommendations’ for your content (and site) all at once. Google cannot ignore this and instantly catapults you to the top of the search rankings.Click here to read an article on types of social content that can boost SEO. No surprises here. Google wants to promote Google+ in a big way against established players, Twitter and Facebook. Results from Google+ have a better chance of finding their way into the top search results. If you want proof, refer to an experiment conducted by Austin based SEO firm, Tasty Placements, which studied how the search ranking of six similar websites changed, with each being promoted on one particular social platform. This infographic provides the results at a glance. The interesting conclusion was that maximum rise in the search engine rankings was seen in the websites promoted via Google+ business page and Google+1 buttons. Your concern at this point, should not be to question whether this is fair or unfair, but rather to create a Google+ business page and Google+ account and add the +1 button to your content to take advantage of this. And here are some tips on how to use Google+ to increase to search rankings. 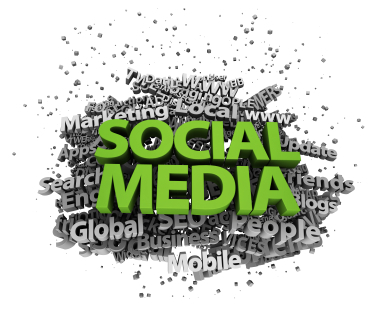 Social media optimization and search rankings are definitely related. Just because you are unable to pin point exactly how the former affects the latter is no reason to ignore this. Because if you do that, the loss will be yours… and quite literally too. This post was written by Yasir Khan, founder of Quantum SEO Labs, passionate SEO consultant and avid explorer of the relationship between social media and SEO. Read more about Yasir’s thoughts on SEO and internet marketing on his blog. In House Web Solutions is primarily a Calgary SEO and Calgary web design firm but also is a vibrant contributor in the online marketing blogosphere! Please feel free to follow our Tweets @inhousesolution or Like us on FaceBook In House Web Solutions or you can also add our owner on google Plus Kevin Lydon for daily marketing and SEO tips.